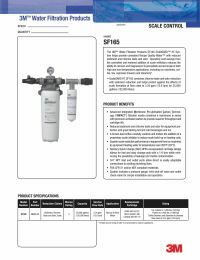 The SF165 Filter System was formerly labeled as Aqua-Pure SF165. Reduced sediment and chlorine taste and odor for equipment protection and great tasting hot and cold beverages and ice. A forced-feed orifice carefully controls and meters the addition of a proprietary scale inhibitor to reduce scale build up on heating coils. 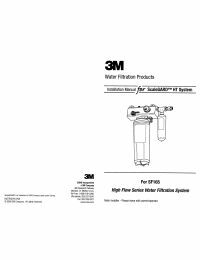 Superior scale reduction performance in equipment from ice machines to equipment heating water to temperatures over 200º F.
System includes a pressure gauge, inlet shutoff valve and outlet check valve, mounting bracket, filter cartridge and scale inhibiting system.